Yesterday was the beginning of the Bioneers conference, which started with a few pre-conference intensives. 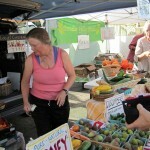 I attended the farm tour and we began the day at the vibrant San Rafael Farmers Market. 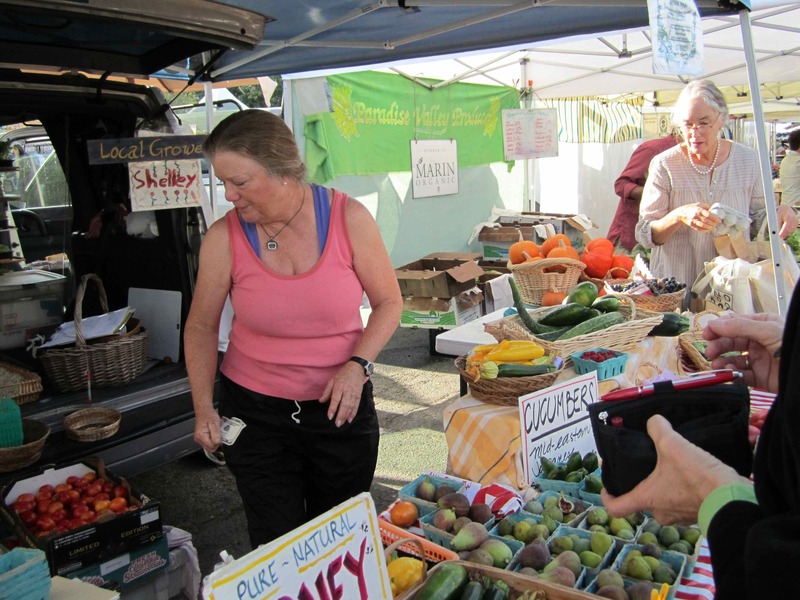 This farmers market is 27 years old and is one of eight markets that the Agricultural Institute of Marin operates. The Sunday San Rafael market is the third largest farmers market in the state, with an amazing variety of vendors, prepared food and it’s lots of fun. I remember walking it last year when I was at the Bioneers conference and I stocked up on goodies for the rest of my trip in Northern California. The theme of the day was diversity for sustainability…the antithesis of the current conventional agricultural model of mono-crops. At the market we met with three growers each providing a different model for sustainable farming. In order for farmers to be sustainable it is crucial that each recognize their own goals as well as local conditions to make what they do viable. There is no one size fits all here, and that is what makes it sustainable. We met with Star Route Farms, the oldest continuously certified organic grower in the state. The cool coastal climate in the area is ideal for lettuces and Star Route Farms really took off selling mini-lettuces to Chez Panisse in the 70’s.Today they sell exclusively to restaurants and at farmers markets. The farm is on 40 acres and they have diversified into other crops that make sense for them and they also farm 20 acres in Southern California in order to have produce available all year round. 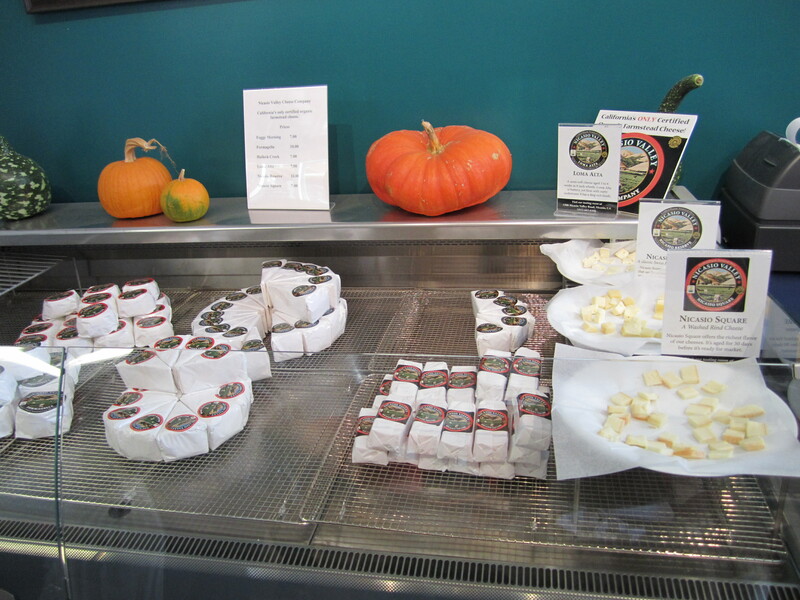 Next we visited with Arrowsmith Farms. Shelley showed us what is possible on a smaller piece of land. 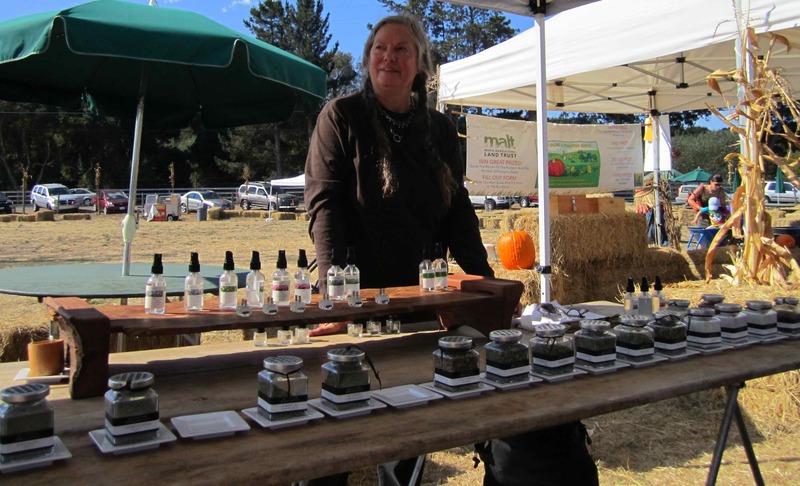 This two and a half acre farm is in Sonoma county, an area primarily known for their wines. Arrowsmith is a beautiful example of how a small piece of land can support diversity and this is the key to making it sustainable and providing something to sell at the farmers market just about year round. A variety of produce including squash, figs, tomatoes, cucumbers, even some raspberries were available as well as their small batch honeys and skin balms. Tulips were recently introduced so that in early spring they could keep bringing something to the farmers market. In learning about growing organically they discovered that having ducks and chickens were an efficient, and non-chemical, way to keep bugs away so that also provided them eggs to sell at the markets. Our last stop at the market was at Full Belly Farms a partnership of three families. This farm has been selling at the market for 25 years and also operates a CSA. They farm 100 crops on 350 acres inland in the Sacramento Valley so they have a very different climate to contend with. This farm started as a seed crop farm-growing crops exclusively for their seeds. Their first market crop was corn and from there they just kept growing. Today they use some of their own seeds and are trying each year to enlarge their seed bank. As much as organic is growing, which is a good thing, it is becoming industrialized and capitalized on by big business. Most farmers at farmers markets began farming this way for philosophical and environmental reasons, or transitioned to organic once they recognized the harm that they were doing. But this is not the case when most large corporations step in. The farmers that we met have learned to contend with market demands while continually taking steps to regenerate the land since this is their most valuable resource. The days tour was led by the Agricultural Institute of Marin and the Marin Agricultural Land Trust-MALT. I will write more about MALT and the great work that they are doing in another post. Many farmers in the area owe their success to MALT’s intervention that protects their land and its agricultural value and often provides much needed capital. We then headed over to the Lafranchi family farm and then to their dairy. They sell their milk to Clover dairy and you can read a little about them here. The Lafranchi’s have an inspiring story of diversity. The family has had a continuously operating dairy since 1919 (and that means continuous since cows get milked twice daily every single day no matter what) and has branched into other areas to make their business viable today. Fifteen years ago to supplement their income they began growing pumpkins and created a pumpkin patch for families to visit. It has been a huge success and there were lots of parents and kids there picking out their pumpkins and having a great time. Since January of this year the Lafranchi’s have been making cheese using their own organic milk under the label Nicasio Valley Cheese, which they also sell at farmers markets. 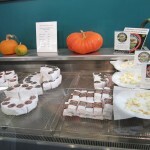 They have been under the tutelage of a cheese master from Switzerland, who is from their family’s original home village, and they are doing quite a good job, receiving excellent reviews from a very food oriented area. In addition to their own farming they lease out land to Allstar Organics. Marty and Janet come from a very different background, both having worked in the corporate world for many years. The love and joy that they have for their newest career is obvious and contagious…they truly are stewards of the land and are having a great time, in spite of the hard work. They started with heirloom tomatoes, not really even knowing what they were or how they should look when ripe. But when they tasted their first harvest they knew they were on to something good. Still growing heirlooms they too have diversified their crops and also branched into other products. 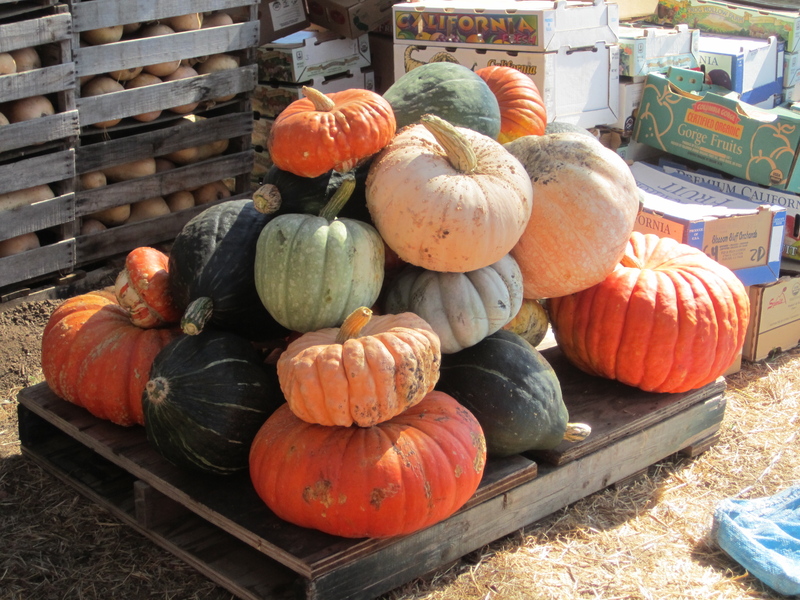 We saw a beautiful array of squash many of which are coveted by local chefs. Here is one hint, some of the ugliest looking ones are the ones most in demand. In order to use more of their crops, and have an incentive to diversify those crops they began experimenting with herbs, salts and even sugars. We tasted some of these delicious salts and I can see how they would be an incredible addition to any kitchen. They also have created a line of hydrosols and essential oils. Another wonderful example of how diversifying can make farming more financially viable by adding new products-even some you cannot eat. 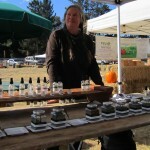 Janet from Allstar Organics with her Salts and Hydrosols-all organically produced. What I walked away with most from the day was the passion and commitment that everyone we met had to their work, whether it was a small farm or a big one, or adventuring into a new world because this is what our planet needs today and it is up to each of us to do what we can. I will also say that it has been a while since I met so many people obviously loving what they do each day and that says a lot to me. If more people were happy with how they spent their days I think that the world would be in a much different place. This is a good lesson for all of us to follow our passion and the rest will come. Doing good brings good for ourselves, those around us and the planet. You can follow me on Twitter for conference updates throughout the day and you will also find these posts at Ecoversity.